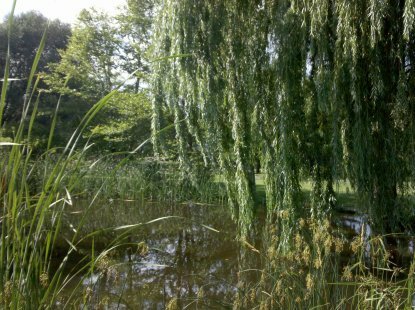 Last Sunday I took a solo ride with Kitten – I was really wanting to ride, but Steve had something on the lathe he wanted to work on, so I decided to head out in search of an Iowa attraction he didn’t have much interest in anyway: the Iowa Arboretum. 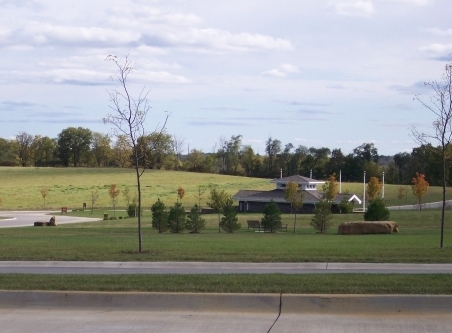 The arboretum is a park-like facility northwest of Des Moines that showcases hundreds of native and non-native trees and plants. There are perennial beds, landscaped viewing areas, trees and shrubs – and since one of my other interests in life is gardening, I’ve always wanted to go there and simply have never taken time. 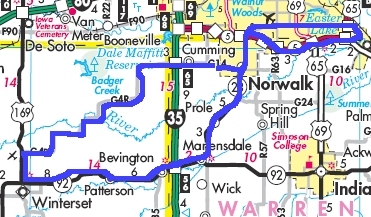 One of the rides we’ve taken occasionally when we want to go but don’t have all day to travel is a loop that takes us past Saylorville Lake, past Big Creek State Park, and up to Madrid and back again. The arboretum is just a bit farther north than Madrid, so adding it to the loop was a snap: heading west on Highway 210 out of Madrid, just past the “alien structures” (which don’t look so alien anymore, now that there seems to be a walking path up on top of them), is a turn-off onto a county road that takes you to the Boy Scouts’ Camp Mitigwa. That road becomes R26, which is one of those Iowa gems: easy, sweeping curves, a hillcrest (clearly marked with a yellow sign reading “HILL,” just in case you weren’t sure) offering a really pretty view of the valley at the bottom, lush green Iowa meadows and hard-working homesteads on both sides of the road. R26 comes to a T at E57, and the arboretum is at the end of a turn-off just back to the east of the T.
This is the type of place where I could easily spend an entire afternoon – it’s just over 375 acres, and I didn’t even scratch the surface of exploration since I only stayed about 30 minutes. 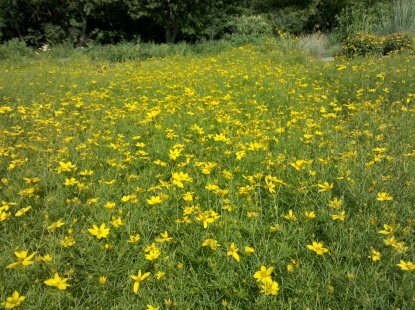 I did manage to take some neat pictures of the small portion I walked through. Back on the bike, I continued east on E57. Looking for Highway 17, I discovered that it’s poorly marked: I came to a two-way stop and since this was approximately where I was expecting to find 17, I took a chance and turned to the south. A few hundred yards down the road, there was my “State 17” sign. Would’ve been helpful to have a “Junction” sign back on E57, but at least I was on the right road. This took me back through Madrid, where I stopped for a potty break and then headed home on the same roads I had taken on my way up: past Big Creek, through Polk City, and past Saylorville. A woman riding alone – she had a red touring bike and was wearing a bright red leather jacket with fringed sleeves. She waved enthusiastically as we passed each other, and I did likewise. Several areas where recent heavy rains have gully-washed gravel and debris onto the road. Extremely high water levels of the Des Moines River: I’ll be really surprised if it doesn’t flood this year. And one thing I managed to avoid: I was riding at one point about a hundred yards behind an SUV towing a boat, and the fabric cover on the boat suddenly ballooned up and blew off. I slowed way down, but it floated like a giant purple parachute off to the side of the road. Since the driver kept going, I’m not sure he even knew what had happened! 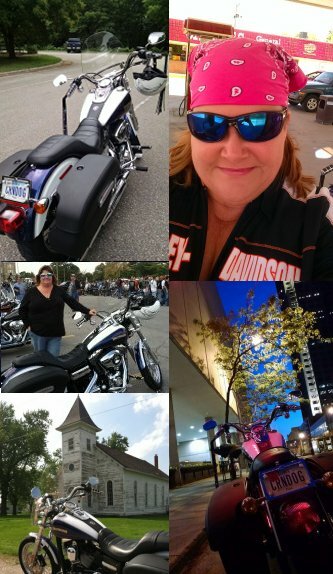 In all a really nice ride, and a little outside the norm since I don’t ride alone all that often. There are a few more photos over on Webshots. I am still job-hunting these days but I will admit that the one thing I like about being unemployed is that I don’t have to wait for the weekend to take a day trip! 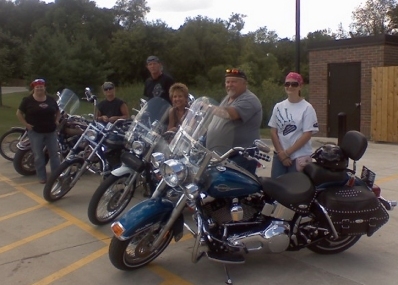 Last week we were invited by new pals Janet & Gerry to take a ride on Friday the 25th in search of some of the towns in our local HOG chapter’s “scavenger hunt” series. 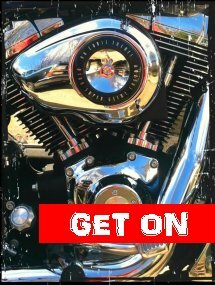 In the scavenger hunt, the idea is to ride to a list of towns and take pictures of yourself and your bike next to something that identifies the town – a welcome sign, post office, etc. – and turn in your photos to compete for prizes. 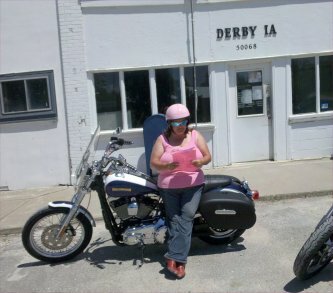 Janet had mapped out a loop that would take us to three of the towns: Swan, Columbia, and Derby, and back up to Indianola for a visit to Route 65 Harley Davidson. We couldn’t have had a more perfect day for a ride – sunny and hot, but not too humid. Steve had decided he wanted to reminisce about “the old days” and try riding without his windshield, which he had removed the day before while cleaning his bike. “I’ll just try it ‘au naturale,‘” he said. 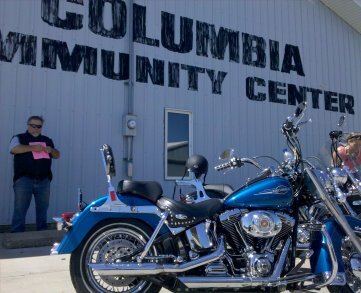 We took off from Big Barn HD around 9:30 a.m. and headed south through Des Moines, past the state fairgrounds and then along Vandalia Road – which, once you get past the industrial “arm pit” portion, is a very pretty ride to the southeast. We left Swan and picked up Highway 5 heading southeast, then turned south at Highway 14. Our next stop was supposed to be Columbia. We soon came upon a nice junction-type intersection that I was sure would be our turn – only it wasn’t. Kept going, and shortly came up over a hillcrest and suddenly our turn was on the left – not marked with a regular green highway directional sign, but the only indication being a white sign on the left bearing some sort of commercial message along with the name of the town and an arrow. I managed to get slowed enough (down from 55) to safely make the left-hand turn, as did Gerry and Steve – but Janet, who was directly behind me, did not. She was forced to make a nasty U-turn in the middle of the highway, with that stupid hillcrest preventing a really safe judgment as to oncoming traffic. She safely made the turn-around and joined us on the road into Columbia – a town so small its population is not even noted on my state map. We paused for more pictures in front of the Columbia Community Center and I think that between the guy running the tire shop, the guy driving back and forth (why?) hauling a long horse trailer, and the older man sitting on his porch next to the park, we saw all the permanent residents of the town. We headed back out toward the highway and watched Janet almost get skewered by a guy driving a large industrial forklift – for some reason (maybe because I was in the lead and displaying too much blindingly pale cleavage, but I can’t be sure) he wasn’t paying full attention, and turned VERY wide out onto the road into our lane – I zipped past him okay but Janet had to scoot wayyy over to the right, all the while staring down the barrel of one of two giant “tines” on his forklift. South of Chariton, we picked up H50 and headed west over to Derby, our third stop. Once there, we pulled in front of the Post Office (“US Vehicle parking only” – hey, we are from the US so we parked there – plus, the postmaster had clearly marked the front door “out to lunch.”), and immediately noticed that the PO was the only building in the short little strip that was presently occupied by anything other than possibly animals – everything else, though in the past they must have been businesses, appeared to be empty. We picked up Highway 65 to the north just outside of Derby – a section of highway obviously in cahoots with Highway 14 – and rode north into Indianola. 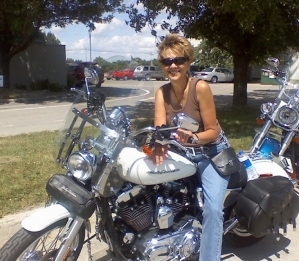 A visit to Route 65 HD and lunch at the One Stop completed our trip – from there it was a straight shot along Highway 65/69 into Des Moines, where we waved good-byes to Janet & Gerry as they continued north. It was a beautiful day, and the good news is my cleavage is now getting tan so I won’t be blinding any forklift drivers for the rest of the summer. 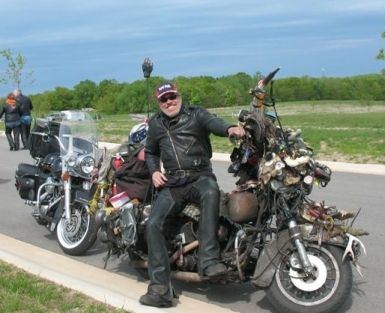 And, bonus for Steve: without the windshield he was afraid he would lose his favorite hat so he rode without that, too, and later found that his, um, thinning hair… had caused his scalp to be vulnerable to the sun’s rays. Needless to say, a top-of-the-head sunburn makes hair brushing a little painful. Freedom Rock is a large boulder situated on Highway 25 just north of Greenfield, Iowa. 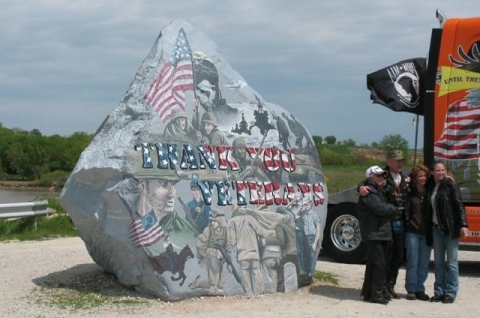 Each year, artist Ray Sorensen paints a veteran-themed collage on the rock to recognize US veterans. That’s Ray in the white sweatshirt. Here’s a great-looking “rat bike” full of memorabilia – the riders also stopped at the veterans’ cemetery in Marshalltown, Iowa.